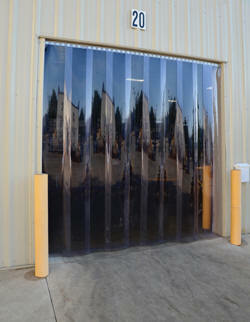 Vinyl Strip Doors help control noise, dust, fumes, and smoke while minimizing drafts, reducing illnesses, and accidents. The strip doors offer visual clarity without sacrificing safety and the fire resistant material is self-extinguishing. 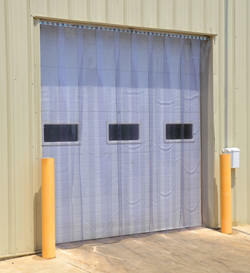 The material design also deters UV rays during direct sunlight when applied to load docks and external doorways . The simple low cost design is easy to maintain, while reducing heating and cooling costs. Standard material design meets USDA Requirements and is great for refrigeration applications up to -10 degrees Fahrenheit. 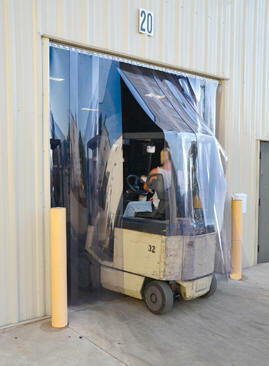 All doors are shipped pre-assembled and ready for installation. Installation hardware not included. Custom door sizes and material available, contact factory. Vinyl Strip Doors help control noise, dust, fumes, and smoke while minimizing drafts, reducing illnesses, and accidents. The strip doors offer visual clarity without sacrificing safety and the fire resistant material is self-extinguishing. 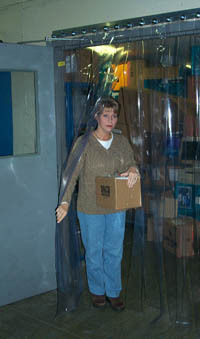 The simple low cost design is easy to maintain, while reducing heating and cooling costs. The low temperature strips are made designed of a softer PVC compound which remains pliable in temperatures as low as -40 degrees Fahrenheit. All doors are shipped pre-assembled and ready for installation. Installation hardware not included. Custom door sizes and material available, contact factory. Resists alcohol, aliphatic hydrocarbons and oils. Can be effected by ketones and esters. User should test for specific application.